After blowing a steady 20-30 mph for the past four days, the winds have finally subsided to 10-15 mph. It’s time to continue south. It looks like most of the nine other boats in the Cambridge mooring field are also taking advantage of this opportunity. We had hoped to jump out into the Exuma Sound for some fishing but the seas have not settled down enough. We plan to travel on the inside (bank) route today. With a shallow reef just past the mooring field, we must wait for high tide for our departure. The narrow (30 ft. Wide) channel through the reef has only 5 ft. depths at low tide. This is one of many areas on our chart that is designated as VPR (visual piloting rules). “Good weather, sunlight, bottom reading, and piloting skills required.” These areas always make us a little uneasy. High tide today is at 12:15. We decide to leave around 11:00 AM which puts us at mid tide. This should give us enough depth to get over the reef. The one thing we don’t have today is good sunlight. The overcast sky makes reading the water depths more difficult. 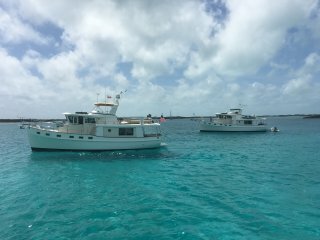 Our delayed departure gave us the opportunity to say hello to the two Krogen boats, LiLi and Salt’ n light. They were pulling into the anchorage just as we were leaving. I an sure we will see them again somewhere south of here. We are all heading to Georgetown. It is a short 12 mile trip to our next anchorage of Big Major Spot. This is a popular anchorage among boaters. 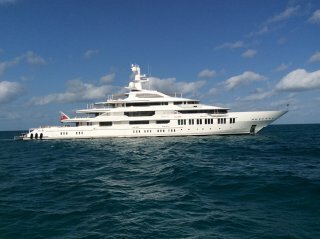 Even the mega yachts hang out here. 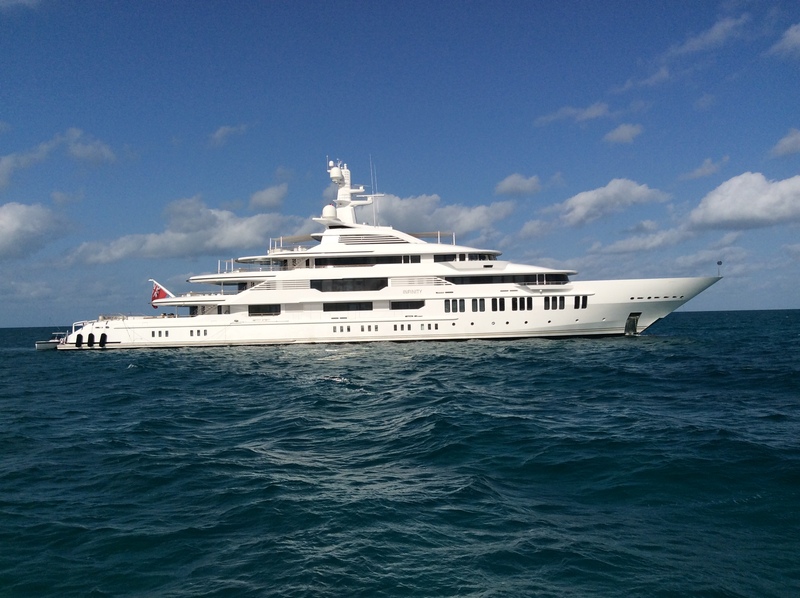 There are four of the 100 + footers in the anchorage when we arrive. They have all their toys out, jet skis, runabout fishing boats, and water slides, for guest to play in the crystal clear waters. 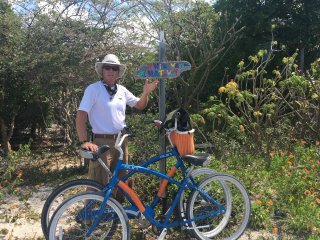 The small village of Staniel Cay is just a short dinghy ride from here. They have a small airport with daily flights to the U.S. The convince of picking up guests and the good holding are what draws so many boaters to this anchorage. The two main tourists attractions which everyone comes here for are the swimming pigs and Thunderball Groto. 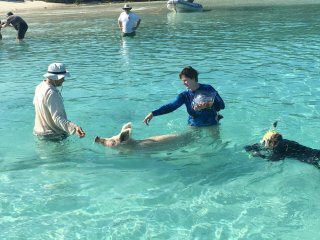 Yes, there are swimming pigs on the small beach at the head of our anchorage. 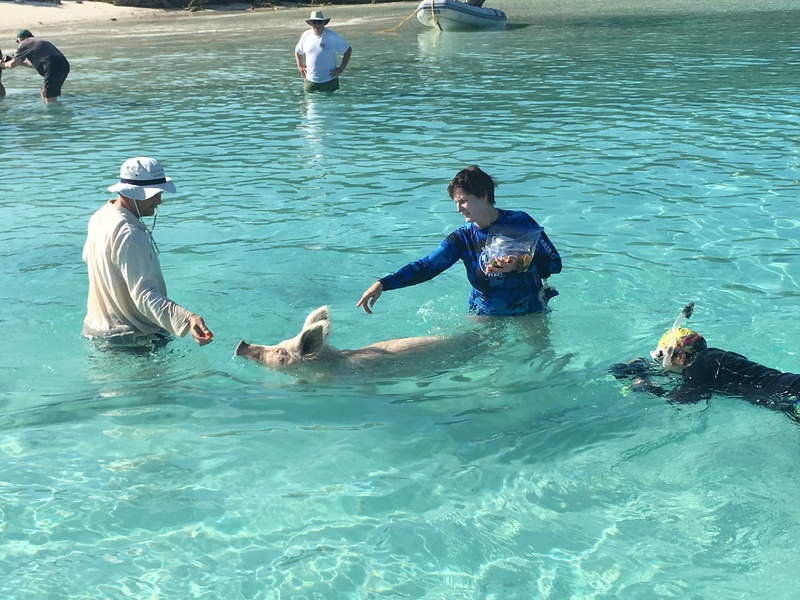 Boaters go ashore daily to feed these wild pigs. They can be quite aggressive. As soon as they see a plastic bag in your hands they come after you. They have even been know to climb in the boats. With many people on shore feeding them, we keep our distance. We don’t want them to get in our dinghy. 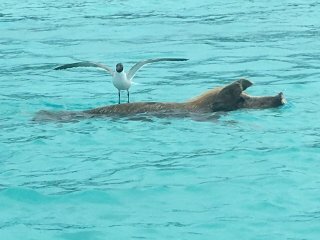 Jeff says they are bacon if they try to come aboard. 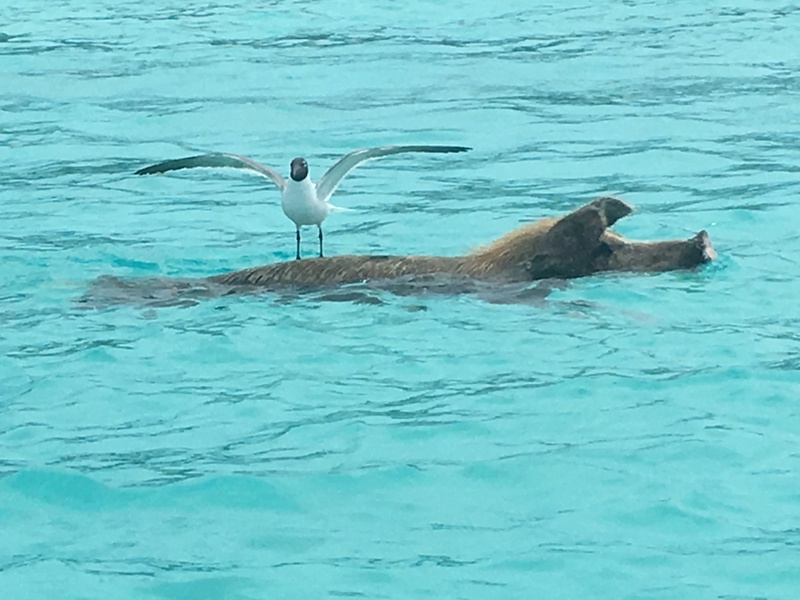 After seeing the pigs, we make the short dinghy ride to Thunderball Groto. This was the site of a James Bond movie, Thunderball.. The cave has three entrances which are best snorkeled at low slack tide. Once inside the cave, there is room to stand and admire the limestone architecture. Shafts of sunlight penetrate the ceiling and illuminate the cavern. Our next stop is the busy village of Staniel Cay. The yacht club is the main attraction here on the island. The mega yachts take up the dock space. 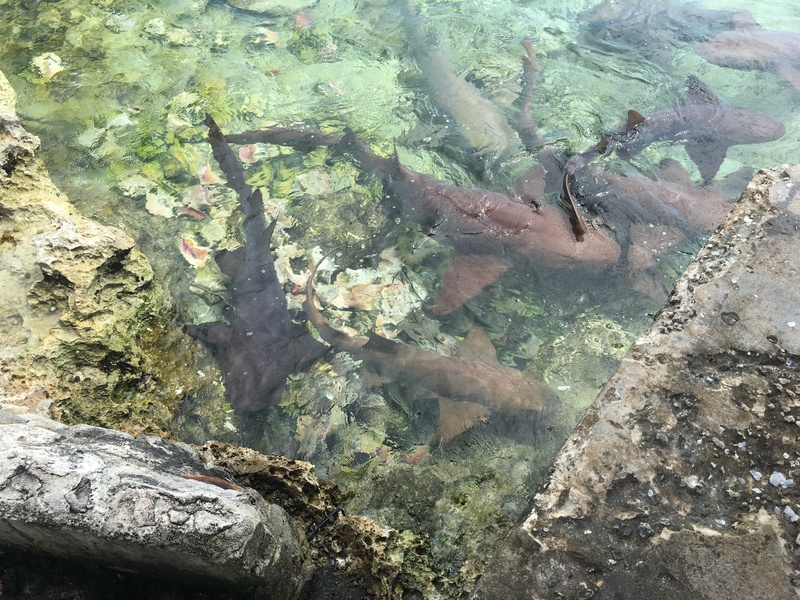 Outside the busy restaurant, tourists watch as about 15 nurse sharks circle the fish cleaning station looking for scraps. 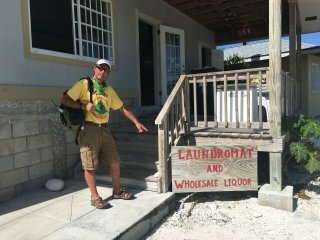 A short walk from the yacht club brings us to the two grocery stores, one in the pink house and the other in the blue house. The yellow house is the bakery and golf cart rental. 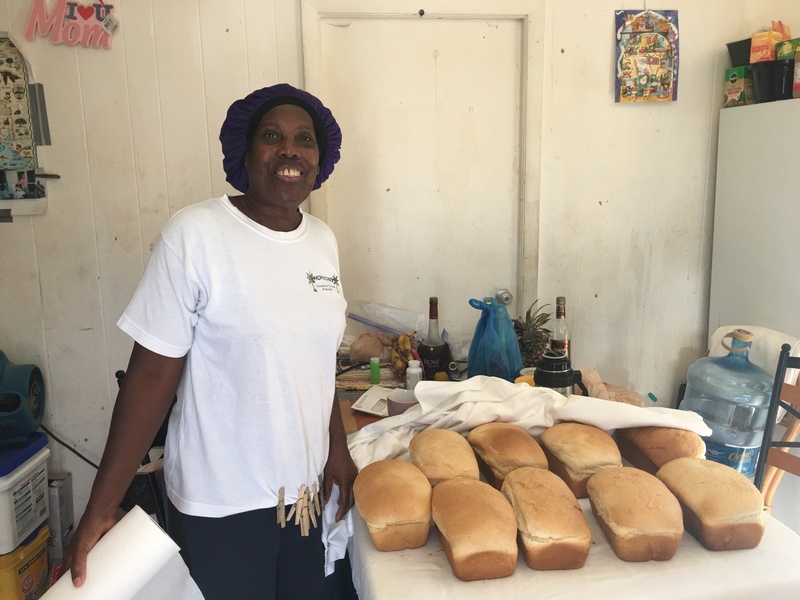 They are out of bread for today so we place our order for pickup tomorrow AM. 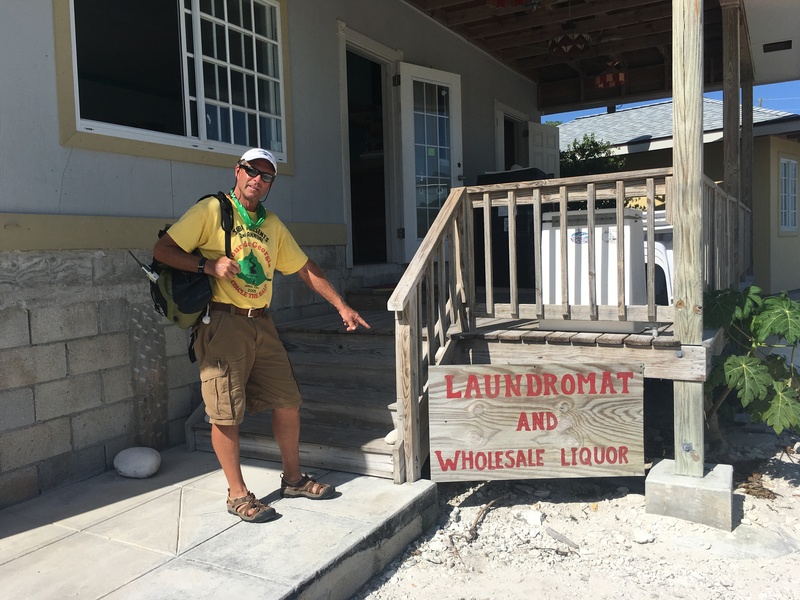 Besides the Laundromat which is also the liquor store, that is pretty much all there is to Staniel Cay. Returning to Idyll Time, we see our two Krogen companions, LiLi and Salt’ n Light have arrived. Plans are soon made for the seven of us to dine at the SCYC this evening. We enjoy a great meal of fresh Mahi and good company. The next morning finds us early to the bakery where we pick up our still hot fresh bread. After consuming nearly the whole loaf, we rent bikes from the yacht club and peddle nearly the whole island in a few hours time. Having been here for two days, it is now time to continue south and explore new territory. 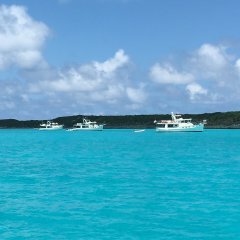 We may even get a chance to try some fishing in the Exuma Sound tomorrow. This entry was posted on April 25, 2016 at 11:06 pm. You can follow any responses to this entry through the RSS 2.0 feed. You can leave a response, or trackback from your own site.